Tasmanian Devil in a rainbow trout pattern. Removing the wire and running your line through the lure then tying it directly to the hook, or to a swivel on a split ring to which the hook has also been attached, helps to hold jumping rainbow trout making it harder for them to throw the hook. This is a very popular trout spin fishing and trolling lure in New Zealand. It comes in incredible 96 different colours. There are four different weights available: 7, 13.5, 20g (Dual Depth) and 26g. The most popular size by far is the 13.5g model. Use the small 7g version when harling or trolling in clear shallow water or on a clear day when nothing else seems to be working on easily spooked fish. I have rarely seen a big size 26g model in New Zealand and have only seen it used for deep trolling. The 13.5g is far and away the most popular size sold in New Zealand for both trolling and spin fishing. There is also the Dual Depth 20g Tassie Devil that is a relative newcomer to the lineup. It has got to be good when a bit more depth is needed and you don’t have a downrigger. It is also a good choice to try when spin fishing and you want extra depth. When spin fishing from the shoreline of a deeper lake, with the Dual Depth model, let the lure sink down for a good 20 seconds or more after casting before you commence winding. The Dual Depth Tassie is a good lure in this situation because the extra lure weight also aids casting distance and sink rate. Don’t forget to wind slowly so the lure doesn’t rise too quickly to the surface. A fat rainbow hen trout taken on a Tasmanian Devil trout lure in the Stilling Basin, Tekapo Canal, Mackenzie Country. Top: A Dual Depth Tassie Devil rigged with a bead and line tied onto the hook with a Uni-knot. Above middle: A Tassie Devil traffic light pattern rigged with a Kiwi Teaser chemically sharpened the single hook. This is a deadly combination when trolling on Central Otago lakes. Above bottom: This smaller brown pattern Tassie Devil is a 7g version ideal for shallow clear water when fishing to easily spooked fish. I recommend that you replace the through wire supplied with your Tasmanian Devil by running your line straight through the lure and tying it to a swivel, or straight to the hook. If there is a danger that the eye of the treble will get stuck in the end of the lure it is best to thread a plastic bead on first before tying on the hook. When rainbow trout take they frequently jump. The line running through the lure allows it to slide down the line out of the way preventing the fish using it as a lever. I have lost so many rainbow trout over the years using the through-wire that I now never use it at all. Small rainbows, in particular, will leap and summersault repeatedly trying to escape. Often they toss the hook almost immediately when caught! Some anglers replace the treble with a single hook insisting that this ensures a more positive hook up. I’m not sure this is true. Personally, I prefer to remove the wire that the lure comes with from the shop and use the swivel and split ring rigging method shown in the picture. I also like to replace the hook with “sticky sharp” chemically sharpened Owner treble hooks. Reversing the body of your Tasmanian Devil reduces its wobbling-rocking action allowing it to be trolled at a slightly faster speed. I prefer to slow the boat down. Another trick is to thread the body of your Tasmanian Devil onto your line backwards so that it has less action when trolled behind the boat. This permits faster-trolling speeds. I don’t like doing this. It is better to slow down the boat. It makes no sense to speed past fish that might otherwise take the lure. Idea speed for the 13.5g version is between 2 and 3 kph. You should lower your lure down into the water beside your boat and adjust speed so the lure looks good. At the correct speed, you will notice a pulsing at the rod tip. If you pick up a bit of weed the rod tip will go “dead” indicating you should wind in your lure and check it. Tassie Devils first went on sale in New Zealand back in 1980 and have been tremendously popular trolling and spin fishing lures ever since. They come in a bewildering array of colours. This begs the question as to which colours are best to use; when; and where! I have found the more natural colour schemes to work well for me with browns and rainbows. The line threaded through the second hole just behind the head of the Dual Depth Tasmanian Devil. Rigging it through this hole causes the lure to run in a head-down position making it dive down an extra metre. 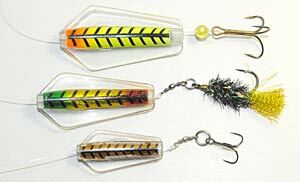 The brown and rainbow trout patterns are “must haves” in your tackle box. I’ve had success fishing the Canterbury high country lakes with the green numbers 6 and 71. In general, the gold and green/gold combination works well and is a good starting point for lake spinning. Perhaps surprisingly some of the more outlandish colours like shocking pink, and purple, have proven themselves top fish takers on some North Island lakes. The “traffic light” red/gold/green colour scheme has long been an excellent choice for lake trolling and spin fishing. It is particularly popular with rainbow trout that appear to go for the “brighter” colours anyway. Tasmanian Devil Trout Lures Brochure pdf. Please note this brochure is provided as a service to our readers only. We do not stock or sell fishing lures. Please contact a tackle store if you wish to buy them. Most anglers are creatures of habit. Once a particular colour has proven successful for us on the regularly fished water we tend to stick with it. I have been out trolling on lakes with other anglers in different parts of the country and it never fails to surprise me just what they tie on their lines and send out the back in search of a trout. Equally, surprisingly these way-out lures and colours actually produce plenty of fish for them. Tasmanian Devils are made in Australia by Wigston’s Lures in New Norfolk, Tasmania, Australia since 1980. 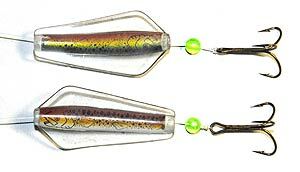 This type of plastic aqua foil lure has largely replaced the more traditional brass spoons of a generation ago. Tassie Devils are made from very tough injected moulded plastic. I have never heard of one being broken by a fish. The colour scheme is painted on under the plastic so there is no danger of the paint wearing off. The reputation of Tasmanian Devils as top trout takers is well deserved. Video: Here is a quick video about the Tasmanian Devil. I was always amazed at some of the guys I first went fishing with, in a fishing club many years ago. I just couldn’t understand why they were always so annoyingly lucky when it came to catching trout. The most incredible thing was that they were consistent. Consistent that is at catching fish when others didn’t. They were part of the elite 10 per cent of trout anglers who catch 90 per cent of the fish! Their secret was simple; knowledge and experience. Download Trolling & Spin Fishing for Trout by Allan Burgess and you can be reading all 156 colour pages on your computer in just a few minutes. You can also print out the pages with Adobe Reader to read later at your leisure. When you download you also get a free bonus copy of 4×4 Motor Bikes & Sport Utility Vehicles for Fishing. More Info and Instant Download NZ$9.95 here.